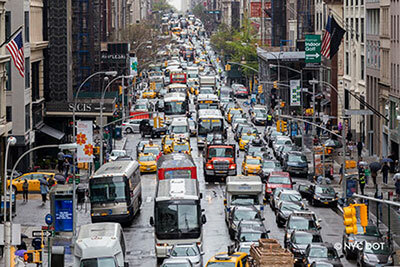 Coined in New York City, the term gridlock means traffic congestion that blocks a city’s network of intersections and has been used to describe the Manhattan core’s overwhelming traffic volume in general. Despite the number of vehicles on our streets, New Yorkers most often choose from a variety of available transportation options including regional rail lines, the 24/7 metropolitan subway and bus system, ferries, cycling, and walking. DOT designates the busiest traffic days of the year as Gridlock Alert Days. Whether traveling for work, errands or recreation, please consider walking, biking or taking public transportation whenever possible. Increased traffic volume and UN Assembly related street closures have a profound effect on the movement of vehicles in Midtown. As a result, weekdays from September 24 - October 1, 2018 are newly designated Gridlock Alert Days. DOT’s Traffic Operations Division conducted analysis using GPS data from medallion taxis and NYCT buses in the Manhattan Central Business District. The analysis revealed that the week of the UN General Debate includes the most significant driving delays. Drivers can expect Midtown travel times up to three times longer than what is typical for that day of week. Public transportation is widely available and an ideal way to travel on Gridlock Alert Days – and every day. Visit mta.info to check the service status of subways, buses, Metro North Railroad and Long Island Railroad. The new MYmta app and website is a great resource for personalized trip planning and real-time service information. Citi Bike is New York City’s bike share system, providing 12,000 bikes at 750 stations in 60 neighborhoods. To help you navigate the city streets quickly and get your shopping done without the hassle of gridlock, Citi Bike is offering 25% off our popular 3 Day Pass in the Citi Bike app using Promo Code "GRIDLOCK" from November 21-28 and December 12-21. For $18, riders can take unlimited 30-minute rides over a 3 day period. Driving from Queens or Long Island to Manhattan? Consider swapping your car for the 7 Train at Citi Field. Our partners at the New York Mets are offering $5 commuter rate parking at Citi Field on weekdays. The entrance to the lot is located on Roosevelt Avenue between 126th Street and Shea Road. Visit the Driving & Parking page on mlb.com/mets for more information. Whenever a vehicle trip is essential, we recommend sharing a Via ride to help reduce congestion by cutting down single-occupancy trips. Via’s powerful technology effectively matches riders going in the same direction to create affordable shared rides, and dynamically routes vehicles in real time to avoid traffic. Via is providing 10% off all shared rides for those who use the promo code GRIDLOCK2018 on Gridlock Alert Days: November 28, December 7, 12-14, and 19-21. Via is also doubling their referral bonus ($20 for both sides) during these days for users with the GRIDLOCK2018 promo code. *Offer may not be combined with other discounts. DOT is working with NYPD to increase the amount of pedestrian space along 5th Avenue, from 49th to 51st Streets. DOT will design and install temporary pedestrian signage to provide information and better manage the movement of people in the area.